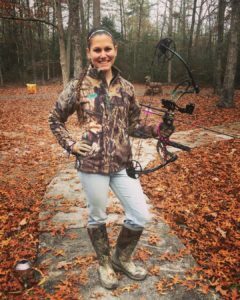 As a well-seasoned whitetail hunter, I know all too well that once I squeeze my trigger or release, the work has just begun. There’s a moment right after I execute a shot, when everything feels still and silent, where I hope and pray all of my hard work and practice has paid off. Once I finally get my hands on my harvest, it’s a feeling that words just cannot describe. This is one of my favorite moments as a hunter. Recovering my harvest and celebrating my accomplishment is only the start though. After the field dressing is done, and my deer is strung up, there’s one important thing left to do before I leave my deer to hang. I need to cut out the tenderloins! The tenderloins are just too good to wait for, and they will often get dried out if left on the deer while it ages. My passion for going full circle with my meals shines through every time I harvest a deer. 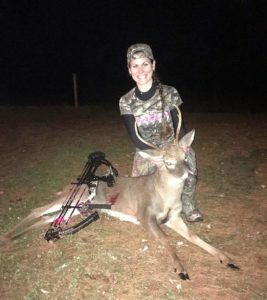 Aside from the first moment I put my hands on any whitetail I harvest, one of my favorite and most satisfying parts of being a hunter is when I get to take the first bite of the deer. Knowing where my food comes from, and knowing the work I put forth to put that meal on the table, is an empowering and humbling feeling. I appreciate each and every animal’s life I take in order to feed my family. 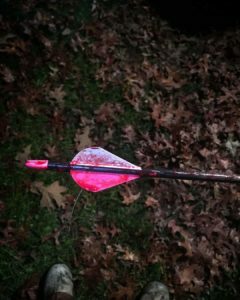 For my first archery buck, I decided to try something new with my tenderloins. Lately, I have seen a lot of venison and wild game recipes on social media that involve wrapping the meat in bacon. I decided I would jump on the band wagon because let’s face it, what isn’t better with bacon? The tenderloins I cooked were so delectable that I had to share this recipe! 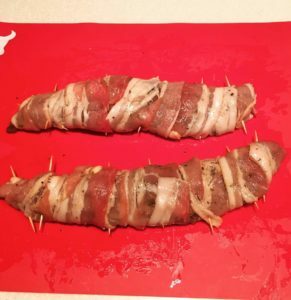 I present to you all my Bacon-wrapped Venison Tenderloins! I like my venison to marinade all day at room temperature, so I prepped the tenderloins the morning I cooked them. After thoroughly washing the tenderloins, prep them with my simple “go-to” marinade that I use on most of my venison steaks and loins. Mix the “Marinade Ingredients” in a large liquid measuring cup. 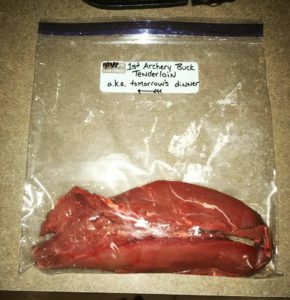 Put the tenderloins in a ziplock bag. Pour the marinade into the bag. Squeeze the air out, and seal the bag up. If you want to save some time in the morning, I’ll fill you all in on a secret. Sometimes, I am lazy and am running late for work. On those days, I just put my tenderloins in a bag and eye ball all of the ingredients. I have used this marinade and these ingredients enough that I know what looks “right.” With a little shake-shake of the bag, after it is sealed of course, the ingredients will be mixed and your meat will be coated. When you are ready for dinner, preheat the oven to 350 degree Fahrenheit. Remove the tenderloins from the marinade and place them on a cutting board. Reserve the remaining marinade for later on. Wrap a piece of bacon around the end of the tenderloin, and secure it with a toothpick. I recommend securing the toothpicks in the meat horizontally, so the meat can lay flat on the pan. You want to wrap the bacon so that the loops travel down the piece of meat. Repeat this step until the loin is completely covered in bacon. For my small “South Jersey deer”, I used 4 slices of bacon per tenderloin. Place the tenderloins on a foil-lined sheet pan. Drizzle a little of the remaining marinade over top of the loin. Place the pan on the center rack of the oven. Bake the tenderloins for 7 minutes a side. (This bake time will have to be adjusted for larger/thicker pieces of meat.) After the first 7 minutes have passed, and your tenderloins have been flipped, heat a cast iron skillet to medium-high heat. When the oven timer goes off, place the tenderloins in the skillet. Cook them until the bacon is seared and crispy (only a minute or two per side). When you’ve obtained your desired crispiness, remove the tenderloins from the skillet and place them on a clean cutting board. Cut the meat between the toothpicks. You can eat the meat directly off the toothpicks if you are in the mood for finger food, or remove the toothpicks to serve. My meat turned out medium, which is a little over-done for me. Next time, I think I will just pan-sear the tenderloin in a cast-iron skillet for 7 minutes a side. This will not be a problem if you have a larger piece of meat. 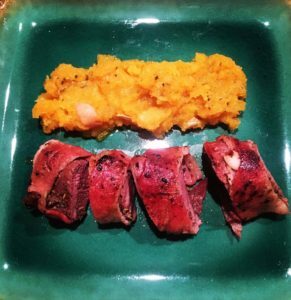 I paired my tenderloin with a garlic and herb butternut puree and a cranberry-feta-almond salad. In the past, I have also served tenderloin with homemade sweet potato fries, mashed sweet potatoes, garlic mashed potatoes, and one of my husband’s new favorites- roasted herb potatoes. If you have any questions about this recipe, hunting, or me personally, don’t hesitate to reach out to me. I love connecting with others that share similar passions. I, like the rest of the GWG family, am always happy to share words of wisdom and encouragement.